What’s Your Financial Philosophy While You Make A Financial Plan? Home > Financial News. Simplified. > What’s Your Financial Philosophy While You Make A Financial Plan? Recently my colleague, Aditi wrote a stunning piece titled,” Where Do Finances Fit In Your Relationship?”, and while reading the article, I was constantly thinking about one of my financial planning clients from Delhi, Mr & Mrs Shekhavat. Mr & Mrs Shekhavat had completely contrasting personalities, Mr Shekhavat (41), a chiropractor, was a man of few words, while Mrs Shekhavat (37), a content writer was the embodiment of Geet, the talkative Punjabi Kareena Kapoor from jab we met. Their contrasting personalities were also evident in their philosophy with money. He was a cautious investor, having witnessed his father suffer a huge loss in the stock market crash of 2008 and thereafter declaring, ”stock markets aren’t my cup of tea”. On the other hand, Mrs Shekhavat was adept at handling risks, even if it meant incurring a short-term notional loss but making money in the long-term. She understood the very core of equity investing, i.e. investing in the stock market is a marathon, not a sprint, and that volatility is the very nature of the equity market. While their personalities differed, Mr and Mrs Shekhavat had common financial goals: To plan for their 3-year old daughter, Kavya‘s graduation needs, post-graduation needs, and wedding expenses. While the goals were simple, the fact that the fulfilment of these goals was dependent on the amalgamation of two completely contrasting risk profiles, personalities, and their financial philosophy, advising and crafting a financial plan was a daunting task. Yet, here’s how I did it and helped Mr and Mrs Shekhavat to create a financial plan so that their dream of providing the best to their daughter came true. The plan was simple: To split up the financial goals equally between Mr & Mrs Shekhavat and then each portfolio will follow a separate but effective asset-allocation and investment strategy. Mr Shekhavat, being the cautious investor, stuck to assured investment avenues offered by banks and government, namely Sukanya Samriddhi Yojana, Public Provident Fund (PPF), bank Recurring Deposit (RD), and Kisan Vikas Patra (KVP). So, to achieve Kavya’s financial goals Mr Shekhavat needed to shell out roughly Rs 70,500 per month for the next 23 years. The plan for Mrs Shekhavat, an aggressive investor, proved to be much different as illustrated below. Return on equity assumed at – 12% p.a. return on debt – 6.5% p.a. return on gold – 4% p.a. Mrs Shekhavat needed to invest only Rs 49,000 per month to achieve her end of the financial goals. Since the goals were all long-term, I ensured that roughly 90% of the investment amount was in diversified equity mutual funds, and the remaining 10% was split between debt and gold mutual funds. Let’s see how they both fared. The table above indicates that Mr Shekhavat could have achieved much more with his Rs 70,500 monthly savings had he chosen another path. This reminds me of Mr Robert G. Allen (an American motivational speaker and author) famous quote: “How many millionaires do you know who have become wealthy by investing in savings account? I rest my case’’. 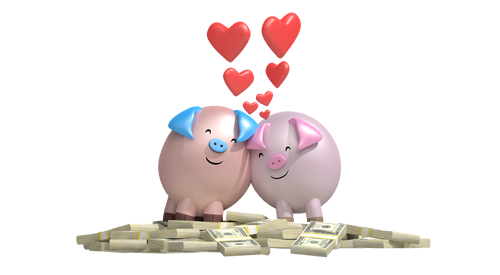 If you are married individual planning for certain common financial goals along with your spouse, conflicting personalities and outlook towards money can hamper your financial plan. And, if you do not know how to proceed, it can leave you stranded in hot water. But all this can be avoided by simply reaching out to proficient and unbiased financial planner who can handhold you in the journey of wealth creation and accomplishing your envisioned financial goals. The next time, you and your spouse are having a tough time deciding the right investment avenue to achieve your financial goal and need an expert financial planner, look no further. Connect with PersonalFN’s Certified Financial Guardian on 022-61361200 or write to info@personalfn.com. You may also fill in this form, and soon our experienced financial planners will reach out to you. I am 65 year partly retired but still a working man in construction field. pl contact me.